Research shows correlations between consumption and various aspects of health. Although mostly known for its caffeine content, coffee is a complex mix of carbohydrates, lipids, amino acids, vitamins, minerals, and a wide range of phytochemicals. "Coffee is known to be a complex mixture of more than 1,000 bioactive compounds that may have beneficial antioxidant, anti-inflammatory, antifibrotic, and anticancer properties," says Robin Poole, MB ChB, MRCGP, PGCert, MSc, MFPH, a physician and public health doctor at the University of Southampton in England. "Coffee contains much higher amounts of antioxidants in a typical serving compared with tea, and, for people who drink coffee, it may be one of the major sources of antioxidants in their diet, perhaps even higher than fruits and vegetables." Researchers have studied many of the active compounds in coffee. "The compounds we know most about are caffeine, chlorogenic acids, and diterpenes," Poole says. Caffeine is an alkaloid that generally stimulates the central nervous system, but it also has significant antioxidant properties.1,4 (The decaffeination process, therefore, decreases the antioxidant potential of coffee. )4 But caffeine alone doesn't account for coffee's health benefits. "There may be a synergy between caffeine and the other ingredients, which is why noncoffee caffeine doesn't appear to have the same beneficial effects as coffee," Poole says. In November 2017, The BMJ published an umbrella review of meta-analyses that was designed to assess all of the existing evidence of the effects of coffee consumption on health. "The umbrella review assimilated the vast body of existing higher-level evidence for associations of coffee drinking and multiple health outcomes," according to Poole, who's lead author of the review. "The intention was to identify potential harms before we progress to a more definitive randomized controlled trial in the future in which coffee could be given as a potential treatment." The review included data from 201 meta-analyses of observational research on a wide range of conditions. It also analyzed 17 meta-analyses of randomized controlled trials with outcomes related to blood pressure, cholesterol, triglycerides, and pregnancy.1 "The great news was that aside from pregnancy, drinking coffee was more frequently associated with benefit than harm," Poole says. The BMJ umbrella analysis discusses the effects of "high" vs "low" coffee intake. It's important to note that there was no consistent definition of what constituted "high" vs "low" intake across the original meta-analyses reviewed. In some studies, "high" intake could be two cups and more, while in others it was six. But Poole and his colleagues found that the results were statistically stable when analyzed in several different ways: The same associations between coffee intake and health outcomes were found when looking at "any vs none" and when using linear dose-response analysis (ie, whether adding one more cup of coffee increased the response). "The stability of results across different exposure categories suggests that the 'high' vs 'low' comparison does represent a reasonable differential even if it is comparing ranges of exposures," Poole says. Consumption of both caffeinated and decaffeinated coffee was associated with lower all-cause mortality.1 An August 2017 study in the Annals of Internal Medicine concluded that this finding holds true for people of many races and ethnicities, including African Americans, Japanese Americans, and Latinos.5 The authors of the umbrella analysis report that the largest benefit to all-cause mortality was seen at "three cups a day." It's important to note that, for this and all other outcomes, the analysis couldn't offer a standard measure for what constitutes a "cup." "Unfortunately, we cannot be specific because the cup size and preparation method would often not be recorded in the original studies that made up each meta-analysis included in our umbrella review," Poole says. "This is because most dietary assessment tools would have simply asked only for the number of cups of coffee consumed each day without more specific details. This type of variation would most likely affect those with and without a specific disease equally, and is statistically more likely to dilute associations than strengthen them, so finding consistent beneficial associations is reassuring. We are not, however, making any recommendations for a target intake." While some people may assume that the stimulant effect of caffeine is bad for the heart, the data suggest the opposite may be true. "Coffee drinking was associated not only with a lower risk of death from any cause, but also death from CVD, or getting CVD in the first place," Poole says. "The greatest reduction in risk for these health outcomes was seen at intakes of three to four cups of coffee a day." Overall, people who reported drinking three cups of coffee a day (of any size) had a 19% lower risk of dying from CVD, a 16% lower risk of death from coronary heart disease, and a 30% lower risk of death from stroke than nondrinkers. Benefits were less pronounced for people who reported drinking more than three cups per day, but no harm was seen. Although coffee appears to have numerous health benefits, that doesn't mean nutrition professionals should encourage everyone to drink it. "It's important to keep in mind that, while there may be populationwide positive health associations with a particular food, any nutrition advice has to work for the individual," says Jen Bruning, MS, RDN, LDN, a spokesperson for the Academy of Nutrition and Dietetics. "Regular coffee can increase energy and alertness, but some people may have anxiety that's ramped up by caffeine. Likewise, coffee may not be the best choice for people with GERD or sleep issues." In addition, as stated above, pregnant women should be cautioned to limit coffee intake, as should women at risk of fractures and individuals with uncontrolled high blood pressure. Eating whole coffee beans or drinking unfiltered coffee can impact blood lipid levels. Even if none of these issues is of concern, drinking coffee isn't for everyone. "There's no reason why anyone needs to start drinking coffee if they don't already, especially if it's not something they enjoy," Bruning says. 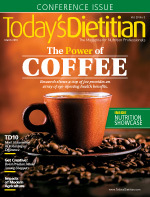 The 2015–2020 Dietary Guidelines for Americans support moderate coffee consumption, defined as up to three to five 8-oz cups per day (providing up to 400 mg per day of caffeine), which is in line with recent research findings.8 Most people who drink coffee in any amount can be assured that coffee itself isn't harmful and may even be beneficial to their health. Clients should, however, keep in mind that the health effects of coffee can be impacted by other factors. "People need to be cautious around fancy, elaborate coffee drinks," Bruning says. "These typically have added fat and a lot of added sugar in the form of flavored syrups, not to mention the extra calories. For a change from a plain cup of coffee, a low-fat cappuccino or latte is a great way to go. They provide that coffee flavor, a caffeine boost, and some protein and calcium in the milk. Dusting with cinnamon or cocoa powder gives flavor without the fat, sugar, and calories." People also should be counseled to watch what they eat with their coffee, since cakes and cookies are popular but unhealthful choices. "If people are already drinking coffee, they should continue to enjoy it," Poole says, "but try to keep it as healthful as possible." — Judith C. Thalheimer, RD, LDN, is a nutrition writer and speaker based in Philadelphia, Pennsylvania. 1. Poole R, Kennedy OJ, Roderick P, Fallowfield JA, Hayes PC, Parkes J. Coffee consumption and health: umbrella review of meta-analyses of multiple health outcomes. BMJ. 2017;359:j5024. 2. National Coffee Association USA. Daily coffee consumption up sharply. http://www.ncausa.org/Portals/56/PDFs/Communication/NCA_NCDT2017.pdf?ver=2017-03-29-115235-727. Published March 25, 2017. 4. Higdon J. Coffee. Oregon State University Linus Pauling Institute Micronutrient Information Center website. http://lpi.oregonstate.edu/mic/food-beverages/coffee#bioactive-compounds. Updated June 2017. 5. Park SY, Freedman ND, Haiman CA, Le Marchand L, Wilkens LR, Setiawan VW. Association of coffee consumption with total and cause-specific mortality among nonwhite populations. Ann Intern Med. 2017;167(4):228-235. 6. Rodríguez-Artalejo F, López-García E. Coffee consumption and cardiovascular disease: a condensed review of epidemiological evidence and mechanisms [published online January 10, 2018]. J Agric Food Chem. doi: 10.1021/acs.jafc.7b04506. 7. Lyngsø J, Ramlau-Hansen CH, Bay B, Ingerslev HJ, Hulman A, Kesmodel US. Association between coffee or caffeine consumption and fecundity and fertility: a systematic review and dose-response meta-analysis. Clin Epidemiol. 2017;9:699-719. 8. 2015–2020 Dietary Guidelines for Americans: answers to your questions. ChooseMyPlate.gov website. https://www.choosemyplate.gov/2015-2020-dietary-guidelines-answers-your-questions. Updated January 7, 2016.